It isn’t 4th of July without celebrating by watching some amazing fireworks light up the night sky. Luckily for you we rounded up some of the best places around to watch the fireworks. No matter if you are in Los Angeles, the South Bay or Long Beach we have found a spot close by to see the fireworks. The AMERICAFEST, presented by Honda, is a grand festival celebrating Independence Day. At 2pm the the Family Fun Zone opens, at 5:30pm the stadium opens, at 7pm the performances begin and at 9pm the fireworks go off. Although the event does cost around $20, you get your monies worth with an all-American experience consisting of: classic American food, a motorcycle stunt show, inflatable games and rides, and a large fireworks display. 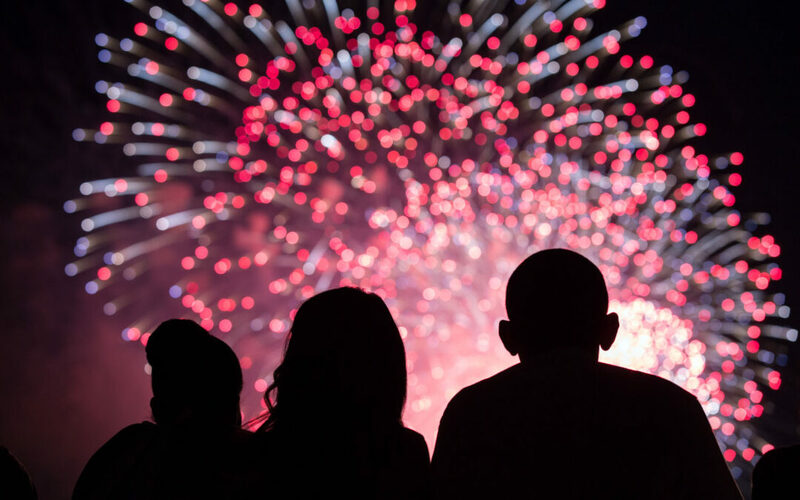 The Pacific Palisades Fireworks will be at the annual Palisades Rocks the Fourth concert at the Palisades Charter H.S.. The concert costs $10 and with that you get access to the live bands, food trucks and a Fireworks showing at 9pm. The Hollywood Bowl will have their Fireworks Spectacular not only of the the 4th of July, but also on Sunday and Monday! Prices for the large event can range from $11 all the way up to $270, depending on where you want to sit. However, kids under 12 get in for half price! There will also be performances by the US Air Force Band, The Hollywood Bowl Orchestra, and Pentatonix. The Fireworks in Marina del Rey can be enjoyed from numerous places on the shoreline, but we suggest heading over to Burton Chace Park or the Fisherman’s Village to see the show with synchronized music. The Fireworks will start at 9pm and go on for 20 minutes! Want to pass the time, waiting for the fireworks to start by combining Dinosaurs and Fireworks? Well Cinespia is throwing a movie screening of Jurassic Park at the Hollywood Forever Cemetery and then launching off their own fireworks after. Tickets for the event are only $35. There will be lots to do at the event including a picnic and themed photo booth! Santa Monica is one of the best places to go experience 4th of July! From 9am-11am there will be a 4th of July Parade, starting on Pico blvd and end at the southern most beach parking lot. As the night approaches you can grab your friends and watch the Fireworks from the surrounding cities from places like the Pacific Park, Santa Monica beach, or the Santa Monica Place dining deck. When the Music Center throws a 4th of July party, you know it is going to be a good time. This year you can head over to Grand Park once again for music, food and large fireworks display! Grand Park is one of the most popular places to celebrate the 4th of July so if your are thinking of going to Grand Park it would be best to get a ride there.You can get $15 off your ride to Grand Park by using the RideYellow app with the promo code “HELLOLA”. The Redondo Beach Seaside Lagoon is on the most family friendly places to watch the Fireworks on the 4th of July. Bring your little ones to the lagoon at get supervised swimming and activities throughout the day and then at night you can take a seat and watch the fireworks! The City of Torrance is hosting the Torrance Fireworks show that can be viewed from the Los Angeles County Courthouse parking lot or the Toyota Sports Complex. You can get your free tickets for the viewing at the Toyota Sports Complex at a first come first served basis at the Center’s Box Office. The El Segundo Fireworks celebration will be held from 10am to 9pm and include a ton of family friendly events. during the day you can partake in the hula hooping, water balloon tossing, sack races and a pie eating contest. During the night there will be live music, food booths and fireworks at 9pm. To top it all of tickets are only $5. For the 67th year in a row the San Pedro Fireworks Extravaganza has make a comeback to the coast. The entrance is FREE and it features music, family friendly activities, food trucks and a fireworks showing from Cabrillo beach at 9pm. The Queen Mary Fireworks is an iconic event that everyone in Long Beach watches. You have the choice of purchasing tickets from the Queen Mary and watching the show directly from the boat or watching them from anywhere else in Long Beach. If you are aboard the Queen Mary you will get dinner, music and to dance the night away on the dance floor. However, if you don’t want to party, you can always cozy up at the beach or Signal Hill’s hilltop park and watch the fireworks from there. For the 30th year in a row The Los Alamitos Air Force Base is throwing their Fireworks Spectacular. There is plenty of room on the base to watch the show and there are tons of kid friendly activities there including bounce houses, a petting zoo and carnival games. Alternatively, if you do not want to watch the fireworks from the base, another great place to watch them is at the outlet parking lots at Rossmoore.